Since 1995, Renaissance Adventures has offered Adventure Quest after-school programs in Boulder, Colorado. 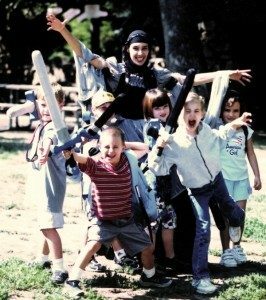 Through our interactive Adventure Quest game, we provide experiential education in via storytelling, theater, improvisation, and fun physical exercise with our safe foam “Swasher sword” sports equipment. We often offer one “Quest” for 4-8 continuous weeks, with each week a chapter in the story that the Questers help to create. Adventure Quest can is combined with creative writing in our Quest & Quill program, in which students write stories based on their adventures. Renaissance Adventures does not have the ability to send confirmation emails for most programs. Please do not expect a confirmation email from us. Please have students bring clothing appropriate to quest outside as much as possible – including boots, hat, and gloves for cold, snowy weather! If you own your own foam sword, please check with the school for their policy about bringing these to schools. 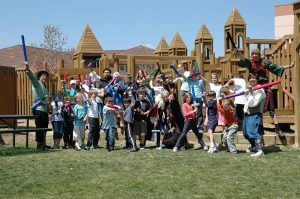 Renaissance Adventures has permission to bring our foam swords for the afterschool program, but not every school allows kids to bring these for the school day. Mondays – 3:30pm – 5:00pm. Tuesdays – 3:45 – 5:00. Thursdays – 3:30pm – 5:00pm. Thursdays – 3:45pm – 5:15pm. Wednesdays – 3:45pm – 5:15pm. Wednesdays – 3:15pm – 4:45pm. Interested in having a Quest after-school program at your school? Does your child want to be part of an on-going Quest program after school? If there are 4-7 children interested, and a willing school, we’ll bring our Adventure Quest program to you! Contact us and we’ll be happy to set one up! Renaissance Adventures can host a number of different programs, customized to the needs of your group, class, troupe, or pack. Activities range from fun and fast-paced Sword Skirmish events, to team building scenarios and challenges, to an in-depth series of Adventure Quest classes where the participants are the heroes of a mythic quest. Renaissance Adventures has captured the hearts and minds of our students. The Quest Leaders have fun with the children and create a climate of respect and creativity. We at Horizon’s have been greatly impressed by the programs offered at Renaissance Adventures. Their talent to inspire creative, imaginative play, blended with their ability to actively interact with our students in a fun, safe, and nurturing manner has made the classes very popular with the students in our school. Renaissance Adventures is a wonderful, unique experience. As a teacher, I really appreciate that the children learn while having so much fun. As a parent, I love how caring and concerned the staff are for the children. 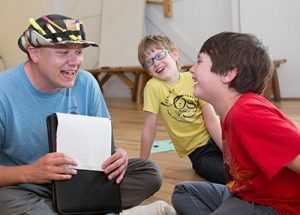 This fine program quickly captures the imagination of children and at the same time teaches important interaction and problem solving skills that empower the child and create an open pathway toward the challenges of real everyday life. Energetic team games with foam swords! Custom events that engage, inspire, and challenge a band of warriors, with different options based upon group size, age, and event length. Skirmishers can take part in a variety of exciting scenarios that develop fitness, teamwork, planning, fasting thinking, and problem solving. 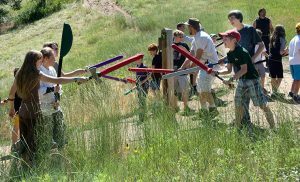 Sword Skirmish activities may include tournament games, structured free-for-all sports, semi-competitive “adventure rallies,” or storyline-driven adventures, all of which make use of our “Swashers” – safe foam sword sports equipment. Sword Skirmishes can be integrated into already existing programs and events, both for kids and adults. For schools interested in hosting an after-school program with Renaissance Adventures, or for schools that allow us to do marketing at school-wide events, we may be able to offer a free Sword Skirmish event. Please contact us for details. Capture the flag with foam swords! (Actually, it’s so much more.) We play popular games such as Revenge, Shapeshifter, Dwarves vs Goblins, and more. Skirmishers are divided into small , semi-competitive teams to overcome a series of challenges that require teamwork, planning, fast thinking, and plenty of dueling. Duel against your friends or the red knight! This drop-in sword dueling booth can be structured as a free-for-all or tournament. Band together to undergo a mission to save the kingdom! Decipher Clues to Discover the Treasure!